THREE college friends with a passion for food decided to open up a restaurant despite having no experience in the food industry. Xanthus Kong, Bryan Lim and Mark Foong did not want their venture to be just any kind of restaurant. It had to have its own unique identity. Something to look at:Instead of looking at empty walls,Frames brings a breath of fresh air within spiring and colourful photographs shot by local and foreign amateur photographers. “It had to be something that would come to a customer’s mind every time they thought of our restaurant,” said Foong. The trio then thought of photography, framed pictures adorning the walls of the restaurant. They worked around the idea and realised that photographs could be the piece de resistance at the restaurant. This led to them naming the restaurant Frames. Foong said the hobby appealed not only to the younger generation but also retirees as cameras were now affordable gadgets for many. 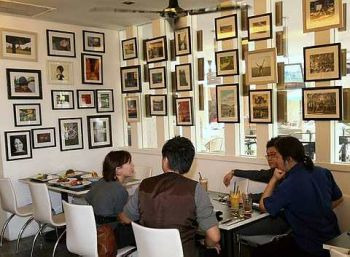 Their new outlet in Sunway Pyramid features framed works of about 10 local and foreign amateur photographers. With a more spacious dining area compared to their previous shop in Taman Tun Dr Ismail, Lim said the customers and food variety had been expanded. Prices for the food had also dropped by 40% but its variety had doubled to suit its current range of customers, who were mostly shoppers and students. A peek into the menu created by Foong, who oversees the kitchen, shows sandwiches and pizzas as new additions to the menu. Tasty and healthy: Mesclun lettuce with slices of roasted beef, topped with tangybalsamic vinegar dressing. During the review, we tasted their best-seller; the Crusted Salmon (RM26.90) from the main course selection. 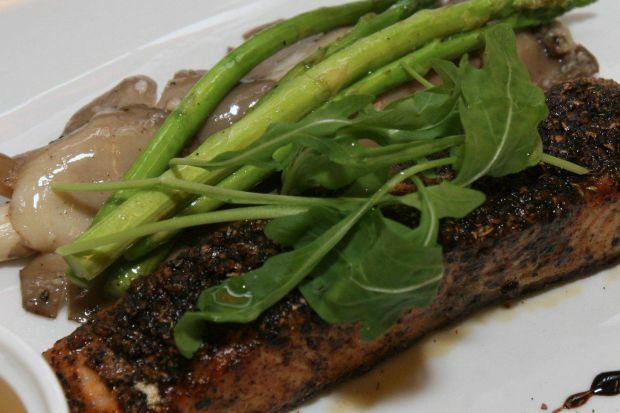 According to Foong, the pan-fried fish is prepared with crusted mixed herbs and pepper for its top layer and accompanied by asparagus, rocket leaves and sauteed abalone mushrooms. 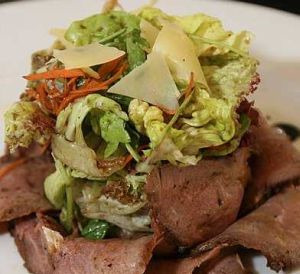 The Roast Beef Salad (RM15.90), on the other hand, is a cold platter with slices of beef placed around the Mesclun Lettuce topped with Balsamic Vinagrette Dressing. For a touch of spiciness, we opted for their Seafood Soup, which tasted just like any other clear tom yam broth. Being a mutton curry fan, the Mediterranean Lamb Ragu (RM25.90) was my favourite. The lamb cubes were tender and felt just right while the Pumpkin Puree which could pass off as mashed potatoes was a great side dish. We also had a taste of the Pan Seared Tuna (RM22.90) and Spicy Seafood Carbonara (RM19.90). The restaurant’s menu changes every six months to give customers a new selection each time they visit the outlet. At present, the restaurant is having a promotion for photographers who dine in on Tuesdays. “As long as you have a camera of any sort we will give you a 20% discount on the bill. “We want to encourage this hobby and also perhaps allow budding photographers to meet with up professional ones to share their passion on the art,” said Lim. The discount does not apply to alcohol.